Introduces the new Gear Chronicle clan. Includes Royal Paladin clan cards. Further introduces the concept of G units with the ability to Stride and help you if you were not able to ride during the new "G-Assist" step. Clans included are Gear Chronicle, Royal Paladin, Kagero, Nova Grappler, and Oracle Think Tank. G Trial Decks will include 4 RRRs as opposed to the usual 1. Along with 2 Sentinels and 2 copies of the Cover Card. 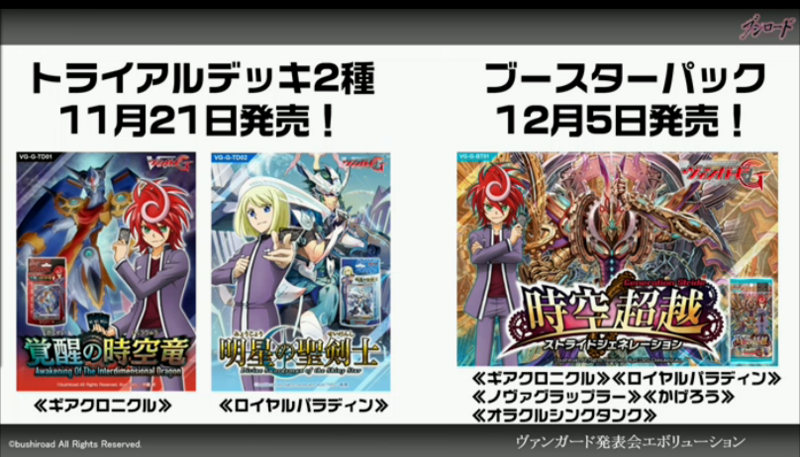 Trial Deck releases are November 21st, BT01 is December 5th.